Do you think this finalist deserves to be the Pitong Pinoy "People's Choice" awardee? Cordillera Ecological Center director Michael Bengwayan has a secret that can revolutionize the energy industry: that of extracting fuel from the petroleum nut, a plant endemic to the Philippines. Why is it revolutionary? "Because it can eliminate our dependence on LPG for cooking," he tells Yahoo! Southeast Asia. Right now, the secret is known to people in four communities in Ifugao and the Mountain Province who have planted around 15,000 seedlings of the petroleum nut. The communities plan to form a cooperative to produce bio-fuel from the trees. The trees need four to five years to mature so fuel can be harvested from the fruits, time enough for Bengwayan to spread the knowledge to other communities there. He has developed a cold press that will allow households to extract a liter of fuel from 13 kilograms of petroleum nut fruit. "It's very simple," he says. If it's so simple, why don't more people know about it? The answer is also simple: the government isn't interested in supporting research and production of fuel from petroleum nut. "I think I've done everything," he says. He has approached the Department of Energy as well as the chairs of the Senate and House committees on energy to no avail. Although the government has ignored the petroleum nut, preferring the imported jatropha plant for a failed bio-fuel project, the plant has attracted the attention of a U.S.-based bio-fuel corporation. The bio-fuel corporation has already harvested petroleum nuts from Kabayan, Benguet and might soon apply for a patent for the use of the plant. Bengwayan has applied for a Philippine patent for the petroleum nut to protect it from what he calls bio-piracy. 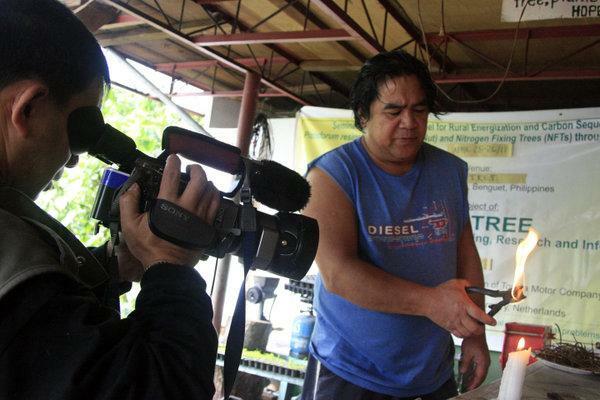 He has yet to get the patent, though, because it costs too much time and money to process.Without a Philippine patent, Filipinos will soon lose the right to grow, process, and use the nuts for fuel Bengwayan warns. "It’s going that way," he says, unless the government moves to develop the petroleum nut as a fuel source. "That's why I'm teaching the communities, so we can prove that we've been doing it even before they got a patent," Bengwayan, who holds training seminars paid for with his own money, says. He said that when he realized there would be no government support for the project, he decided to just teach people how to plant and process the nut while he still can. "What we want is for Filipinos to benefit from this first," he says, and if that means spending his own money, and spending his birthday teaching residents of Sagada town in the Mountain Province how to cultivate and use the nuts, he considers it a gift to himself, to his people, and to the earth. Using bio-fuel will lessen the use of fossil fuels and will fight deforestation too, since locals will no longer have to cut down trees for firewood. He adds the petroleum nut tree’s broad, thick leaves also make it an excellent carbon sink since it absorbs more carbon emissions than other trees. Bengwayan is an environmental activist, a scientist, and has a doctorate in Environmental Research Management from the University College-Dublin in Ireland. In his own words, though, he is an earth-healer. “I like feeling the soil in my hands knowing how much it does to make the world live,” he says on his blog. “There is nothing that I like doing more than caring for the Earth. I love planting. I love working to see to it that soil is not wasted away by slides, erosion and mudflows whether I plant trees or crops or anything that has roots reaching out for the soil,” he says. And that attitude is yet another secret he is trying hard to spread. Read about the other Pitong Pinoy finalists here.